I added the dashed red line to show the stagnation in Illinois. 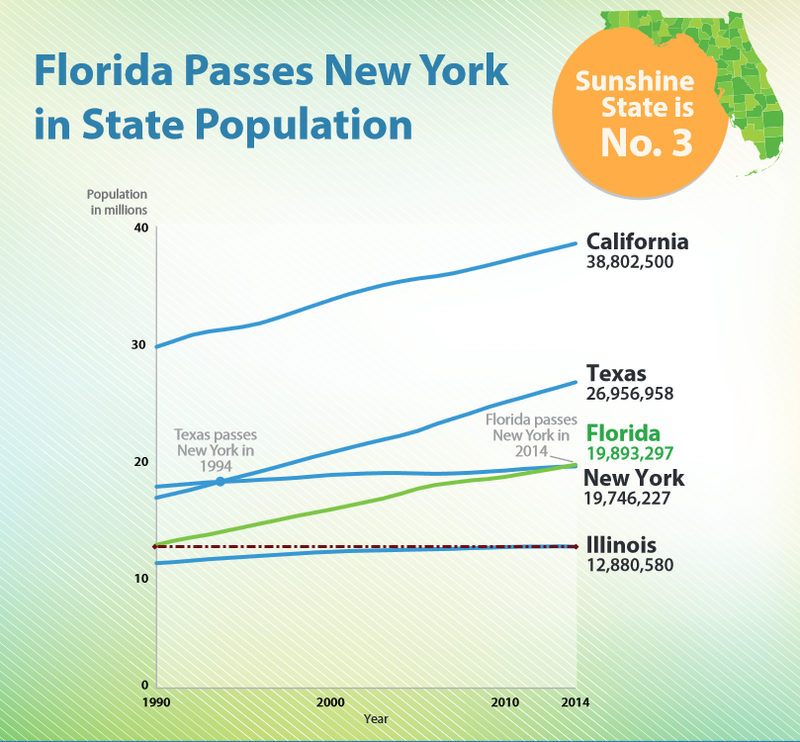 By adding an average of 803 new residents each day between July 1, 2013 and July 1, 2014, Florida passed New York to become the nation’s third most populous state, according to U.S. Census Bureau state population estimates released today. 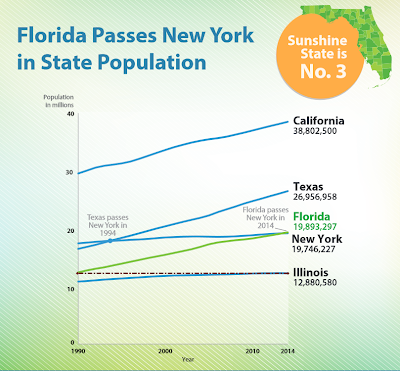 Florida’s population grew by 293,000 over this period, reaching 19.9 million. The population of New York increased by 51,000 to 19.7 million. California remained the nation’s most populous state in 2014, with 38.8 million residents, followed by Texas, at 27.0 million. Although the list of the 10 most populous states overall was unchanged, two other states did change positions, as North Carolina moved past Michigan to take the ninth spot. Another milestone took place in Georgia (ranked 8th), which saw its population surpass 10 million for the first time. North Dakota was the nation’s fastest-growing state over the last year. Its population increased 2.2 percent, followed by the 1.7 percent growth in Nevada and Texas. Each of the 10 fastest-growing states was in the South or West with the exception of North Dakota. Six states lost population between July 1, 2013, and July 1, 2014: Illinois (9,972 or -0.08 percent), West Virginia (3,269 or -0.18 percent), Connecticut (2,664 or -0.07 percent), New Mexico (1,323 or -0.06 percent, Alaska (527 or -0.07 percent) and Vermont (293 or -0.05 percent). States like Illinois and New York continue to lose population to warmer places like Texas and Florida. Heck, Illinois tax policy is so bad, it has lost population to Indiana and Wisconsin. Florida not only has more sunshine than Illinois, it also has no state income tax and lower taxes in general, a nice advantage for retirees. Illinois could easily drop to 6th or even 8th, and probably will do so over the course of the next few years. These trends have some interesting political implications given the US's electoral college voting system of winner-take-all, state-by-state.